What day of the year combines haggis, whisky and poetry with lots of fun and laughter? Burns Night of course! There is no better time of the year to toast the bard and glorious Scotland and WeeBox has all you need to host the perfect Burns Supper, wherever you are in the world! This month, WeeBox was lucky enough to collaborate with the only Centre for Robert Burns Studies in the world (!) to work with their experts to bring you January’s WeeBox! The Centre was established at the University of Glasgow over10 years ago and it’s mission is the development of research, scholarship and teaching in the area of Robert Burns, editing his work for the 21st century. Take a peek at our very special ‘unboxing’ video by Dr. Pauline MacKay on our social channels, who expertly brings your WeeBox to life! The first Burns supper was held in July 1801 when nine of Burns’ close friends got together to mark the fifth anniversary of their friend’s death. Taking place at Burns Cottage in Alloway, the night included haggis, of course, performances of Burns’ work and a speech in honour of the great Bard (now known as the Immortal Memory). The night was such a resounding success they decided to hold it again (this time in honour of Rabbie’s birthday), beginning the tradition we still enjoy to this day. 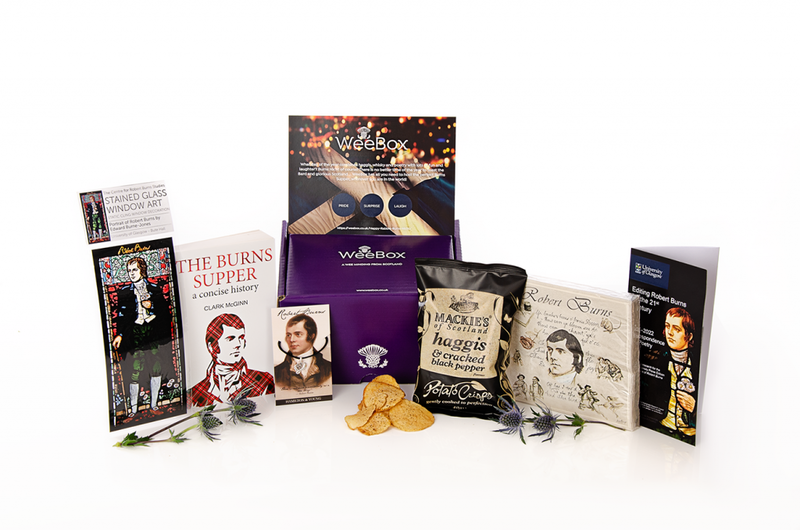 ‘The Burns Supper, a concise history’ book is hot off the press and we have it exclusively for you before anyone else! Clark McGinn is also a PhD graduate of the University and this book comes highly recommended. Spanning the history of the phenomenon, from the year of its creation in 1801 to the present day, this book offers you everything you need to know about the Burns Supper, and the poet for whom it is held every year. From the origins of the custom to its modern day interpretations, from the rituals and traditions to the fun and fellowship, this first full-length study of the unique annual celebration of Scotland’s national poet answers every question you can think of, along with every one you can’t. The perfect Burns Supper is all about setting the scene. So, lay your Scottish table with these bonnie Burns napkins and hang your stunning stained glass window art of the man himself – gie the Bard pride a‘ place! Now to the feast – traditional haggis, neeps and tatties are a must! But as we cannae send you the real haggis, enjoy Mackie’s haggis and black pepper crisps! Try to be believed, perfectly ‘paired’ with Talikser (the single malt from the Isle of Skye) with its smokiness – not for the faint of hearts! The Mackie’s Crisps story goes back many years… to when the Taylor family began farming in Perthshire in 1927, to them teaming up with Mackie’s of Scotland in 2009, and beyond. Finally, don yer best tartan or kilt and to add a wee special touch with this exclusive Hamilton & Young Edinburgh jeweller’s necklace, bearing the Bard’s famous ‘Auld Lang Syne’ for the sing-song and remember to gie it laldie! “Happy Rabbie Burns Nicht 2019” from all at WeeBox HQ! Posted in Uncategorized and tagged Burns Supper, Centre for Robert Burns Studies, haggis, Rabbie Burns, Robert Burns, scotland, whisky. Older →Scottish Winter Festivals – Hogmanay!